The abundant lands between the Gabilan Mountains and the Pacific Ocean burst with stories. Literary giant John Steinbeck told many of them as he turned the Salinas Valley into the "valley of the world." Steinbeck&apos;s stories, which won him a Nobel Prize in 1962, are nearly all flavored with salt-of-the earth characters who live and work in Monterey County. "Not everyone has the good fortune to be born in Salinas," Steinbeck once wrote. But you can base your trip out of the multicultural city where he was born in 1902 and lived fulltime until he began studying at Stanford University. There&apos;s no shortage of hotels in Salinas. 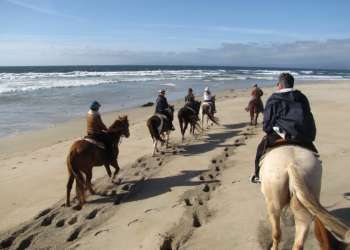 To have a stay with a connection to Steinbeck&apos;s characters, consider choosing one on River Road, which runs parallel to the Salinas River. Elisa and Henry Allen lived off this road in Steinbeck&apos;s short story, "The Chrysanthemums." Begin at the National Steinbeck Center. A Model T Ford, like the one mentioned in "Cannery Row" and "East of Eden," sits at the beginning of the Center&apos;s chronological overview of Steinbeck&apos;s life and times. The multi-sensory tour is replete with big-screen clips from movie versions of his novels starring the likes of James Dean. No matter how much you know about Steinbeck, you&apos;ll find a new angle to appreciate. As you end your tour, you&apos;ll see the green camper Steinbeck drove through 34 states before he wrote "Travels with Charley," parked right inside the museum. Stroll along Main Street, noticing the Art Deco architecture. Many buildings here were built before Steinbeck was born; Nos. 201 and 247 feature in the novel "East of Eden." Click here to access a map of Art Deco locations in Salinas. Head west to Central Avenue to have lunch at The Steinbeck House. John and his younger sisters grew up here. He wrote several stories and novels in this Queen Anne Victorian. Its front rooms are now a homey restaurant, staffed by volunteers from a civic organization comprised of local women. Take Highway 68 west out of downtown Salinas. You&apos;re now in the fertile Salinas Valley, which inspired many of Steinbeck&apos;s stories. Turn off to visit the few streets of what remains of the company town of Spreckels. Steinbeck worked here in the early 1920s, at what was then the largest sugar plant in the world. He gained inspiration here for several of his novels including "East of Eden" and "Of Mice and Men." Continue west on Highway 68 to visit Corral de Tierra, where sandstone cliffs like Castle Rock rise from the still-picture-perfect valley Steinbeck described in "Pastures of Heaven." If it&apos;s still light, continue cruising west to visit Jacks Peak Park to get a birds-eye view of the places Steinbeck wrote about. The highest point on the Monterey peninsula dazzles with sweeping vistas of Monterey Bay, Carmel and the Salinas Valley. With darkness blanketing the Salinas Valley, sample some of its bounty at Tarpy&apos;s Roadhouse. This restaurant, in a rustic stone-hewn building which Steinbeck would have passed on his treks from Salinas to Monterey, serves well-crafted fare alongside a wide selection of California wines. Breakfast at the Paris Bakery in downtown Monterey. It&apos;s a perfect place for people-watching; locals traipse through to pick up fresh breads, newspapers and gorgeous pastries. In 1945, Steinbeck lived with his second wife and son Thom in Monterey; the novel "Cannery Row" was published that year. He owned the Lara-Soto Adobe, at 460 Pierce Street, which he called "a house I have wanted since I was a little kid." It&apos;s now the admissions center at the Monterey International Institute. Just a couple of blocks away, at 155 Van Buren Street, stands the former church where Thom was baptized. It&apos;s now the Mayo Hayes O&apos;Donnell Historic Library. Walk or cycle down the hill to downtown Monterey and take some time to explore its main avenue, Alvarado Street. Most of the pubs Steinbeck visited here are gone, but the scene on this short street is very much like Steinbeck saw it until you reach Custom House Plaza, Monterey State Historic Park. Saunter down Old Fisherman&apos;s Wharf, which features in "Sweet Thursday," the sequel to "Cannery Row." During Steinbeck&apos;s lifetime, immigrant and native Californian fisherman mingled here among their catch of sardines, squid and abalone. Now the wharf is lined with restaurants serving today&apos;s fresh catch. Walk down the Wharf sampling fresh clam chowder, then dive into a plate of Monterey Bay calamari at Domenico&apos;s, Cafe Fina, or Old Fisherman&apos;s Grotto. Walk or cycle west on the Monterey Bay Coastal Recreation Trail toward Cannery Row, renamed in 1958 for Steinbeck&apos;s bestselling novel. It&apos;s a 10-minute ride or a 20-minute walk. Along the way, you&apos;ll glimpse some of the wildlife Steinbeck&apos;s good friend Ed Ricketts catalogued in his lab at 800 Cannery Row, near what is now the Monterey Bay Aquarium. The canneries, grocery stores and smokestacks of Steinbeck&apos;s Row no longer dominate the waterfront here. But at the Cannery Row Antique Mall at 471 Wave Street, you can hunt for treasures from Steinbeck&apos;s era in what used to be the Carmel Canning Company. Continue walking or cycling west, toward the spectacular Lover&apos;s Point in Pacific Grove. The many wooden benches along the way provide good places to admire the view. Turn left on 11th Street to visit the red cottage at No. 147. Steinbeck lived here in 1930 with his first wife. Covered with ivy and hidden by a gated fence, the home is now privately owned. Try the fresh sanddabs at Fandango Restaurant. As you admire the European decor here, consider Steinbeck&apos;s travels: He traveled Europe as a war correspondent and Nobel Prize winner and Russia as an observer of life under communism. He also learned to speak fluent Spanish, visiting Mexico as a sailor and later as a movie director. Complete your journey with a scenic drive through the Salinas Valley. After breakfasting at your hotel, drive south to the small town of Jolon. Steinbeck&apos;s 1933 novella "To a God Unknown" is set here. Visit the nearby Mission San Antonio de Padua, one of the most authentically renovated missions in California. Newspaper publisher William Randolph Hearst once owned the land here; the secluded mission is now part of Fort Hunter Liggett, a U.S. Army base. As you head north, you will pass through King City. Steinbeck&apos;s maternal grandparents raised cattle here. Just a few miles north of King City, you&apos;ll reach the southern end of the River Road Wine Trail, which connects Salinas Valley&apos;s wineries. Much of the land that was once dedicated to ranching is now dedicated to vineyards. If you&apos;re a wine-lover, it&apos;s time to go off the highway and explore the vintages at Scheid Vineyards, Paraiso Vineyards, Ventana Vineyards and Hahn Estates/Smith & Hook Winery. The latter three are in Soledad, where George and Lennie worked at a ranch in "Of Mice and Men." Stop at the Windmill Café in Soledad for a low-key late lunch of a satisfying burger, salad or spaghetti. If it&apos;s still light after checking out of your hotel, head north to Fremont Peak State Park. 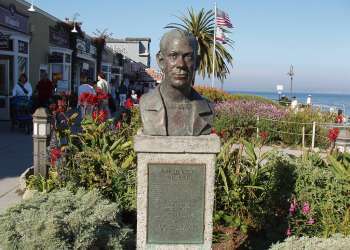 It is here where Steinbeck&apos;s final visit to Monterey County ended in "Travels with Charley." Take in the breathtaking views before you return home.